In association with MBE's latest Twentieth Century Fox Home Entertainment movie review of Legends of Oz: Dorothy's Return, I'm thrilled to be hosting yet another fun family friendly kids movie giveaway! Learn more about this new Fox PG-rated Blu-ray + DVD + Digital HD two-disc set release for home viewing by checking out MBE's review. 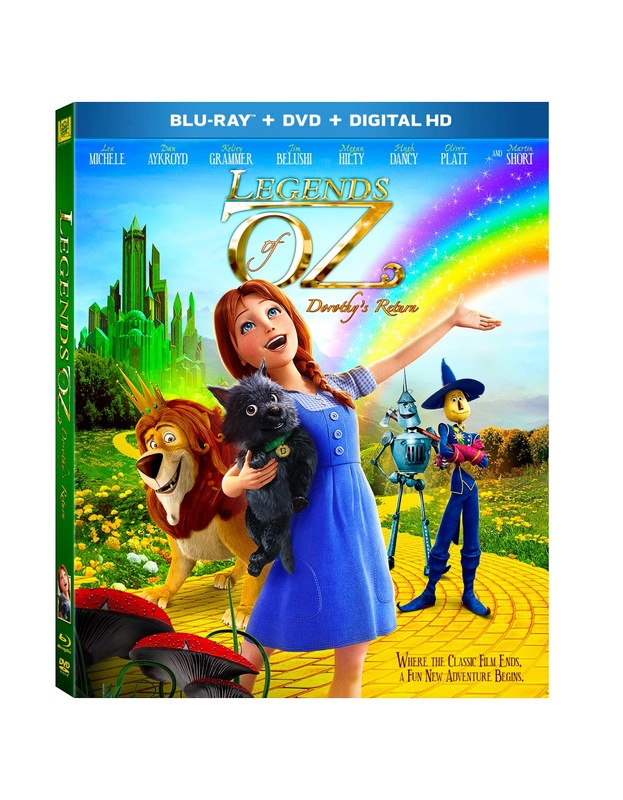 MommyBlogExpert's Legends of Oz: Dorothy's Return Blu-ray DVD Giveaway ends September 3, 2014 at 12 am PT and is open to legal residents of the U.S. only. Fox Home Entertainment will award ONE (1) Legends of Oz: Dorothy's Return Blu-ray DVD Set to the winner. Winner of this MBE contest will be selected at random from all entries and will be notified via email and must respond within 24 hours to claim their prize. To learn more about Legends of Oz: Dorothy's Return, read the review. You can also keep up to date on everything else Twentieth Century Fox Home Entertainment is doing by visiting Foxconnect.com and following the movie studio on Facebook and Twitter. Twentieth Century Fox Home Entertainment is the industry leading worldwide marketing, sales and distribution company for all Fox produced, acquired and third party partner film and television programming. Each year TCFHE expands its award-winning global product portfolio with the introduction of new entertainment content through established and emerging formats including DVD, Blu-ray and Digital HD. Twentieth Century Fox Home Entertainment is a subsidiary of 21st Century Fox. FTC Disclosure: This is a #OzInsiders #FHEInsiders sponsored post. I disclose that I am a Fox Home Entertainment Insider brand ambassador. I received the Blu-ray DVD featured to facilitate the associated movie review post and Fox is providing the prize and shipping for this Legends of Oz: Dorothy's Return Blu-ray DVD Giveaway MBE is hosting. However no payment was received and opinions here are my own. See complete FTC Disclosure information that appears at the bottom of MommyBlogExpert's main page and at the bottom of every individual post on this blog, including this one. For my beautiful daughter! She loves dorothy. Because it's something me and my kids can watch together! because my niece and nephew loved it in theatres. I want to win it because my daughter wanted to see it when it came out in theaters but we missed it. I want to win because my grandsons love to watch the original version and haven't seen this one yet! I wan t to win this for the kids, looks like a great movie that they will enjoy. Because I wanted to see it and havent yet. my daughters loved the movie when we saw in the movie theater. I want to win this for my two youngest granddaughters. I would like to win this DVD because my daughter would enjoy watching it over and over again. She loves the characters. I would love to watch it with my daughter,because I remember how much my mom and I enjoyed watching the first one together. I want to win this because I love anything Wizard of Oz related! I think my family will enjoy it!! I want to win this as it is a movie we can all watch as a family. I want to win it for my niece.